Terriers will seek to continue the turnaround begun last week when they take on New Hampshire at the Whittemore Center in Durham. Puck drop is at 7 p.m. for the contest that will be live-streamed on ESPN+ (subscription). The Wildcats played a road game last night, skating to a 2-2 overtime tie with UMass Lowell, despite being outshot 34-11. UNH got goals from Ara Nazarian and Marcus Vela, while goalie Mike Robinson stopped 32 shots. The Wildcats killed all seven River Hawk power plays and own the best penalty kill in the conference at 87.9%. Defenseman Max Gildon leads the team in scoring with seven points, followed by Vela and Jackson Piersonwith five each. Co-captains Bobo Carpenter and Dante Fabbro pace BU’s offense with six points each, followed by David Farrance with five and Patrick Curry and Chad Krys with four. 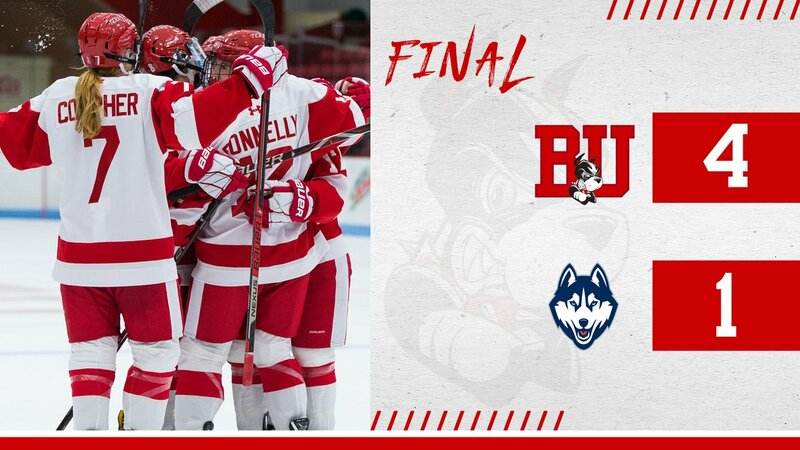 In last week’s series against Northeastern Jake Oettinger rebounded well making 64 saves and posting a 1.98 goals-against average and a .941 save percentage. 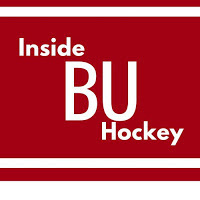 Episode 5 of Inside BU Hockey features Bernie Corbett’s interviews with Head Coach Albie O’Connell and junior goalie Oettinger. A 2017 first-round draft pick of the Dallas Stars, Oettinger was the MVP of last season's Hockey East Tournament. 2019 recruit Trevor Zegras scored twice and assisted on three goals in Team USA’s 8-1 rout of Switzerland at the Five Nations Cup in Kravare Czech Republic. Zegras and his linemates on the U.S.’s top unit combined for six goals and nine assists. Alex Vlasic assisted on the first goal by Zegras who finished +6 for the game. Dom Fensore was +4. 2020 recruit Dylan Peterson scored Team USA’s only goal in a 2-1 overtime loss to Canada Red in a quarter final game at the World U17 Challenge in Quispamsis, New Brunswick. It was Peterson’s second goal and fourth point of the tournament. Fellow recruit and goalie Drew Commesso turned aside 32 of 34 shots and was earned Player of the Game honors for Team USA. Jakob Forsbacka Karlsson is expected to make his 2018-19 NHL debut tonight as third line center for the Bruins. At AHL Providence he has a goal and three assists. JFK joins his former BU teammate Matt Grzelcyk in the Bruins line-up. The two-time All-American defenseman returned to the line-up this week and scored his first goal of the season in an 8-5 loss to Vancouver. 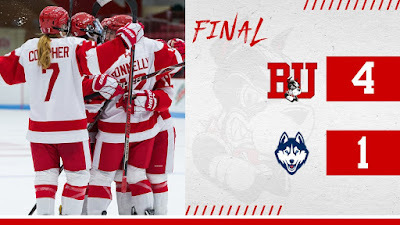 Terriers received two goals apiece from sophomore Jesse Compher and junior Sammy Davis en route to a 4-1 win against Connecticut at Storrs on Friday. Compher’s first period goal, assisted by Abby Cook and Abbey Stanley was matched by a Husky goal late in the second. But just 47 seconds later, Davis stole the puck and scored unassisted. Compher’s second goal was a shorthander early in the third, assisted by Davis and Breanna Scarpaci. Davis closed the scoring with an empty net goal with Compher and Stanley getting helpers. Goalie Corinne Schroeder stopped 30 UConn shots.